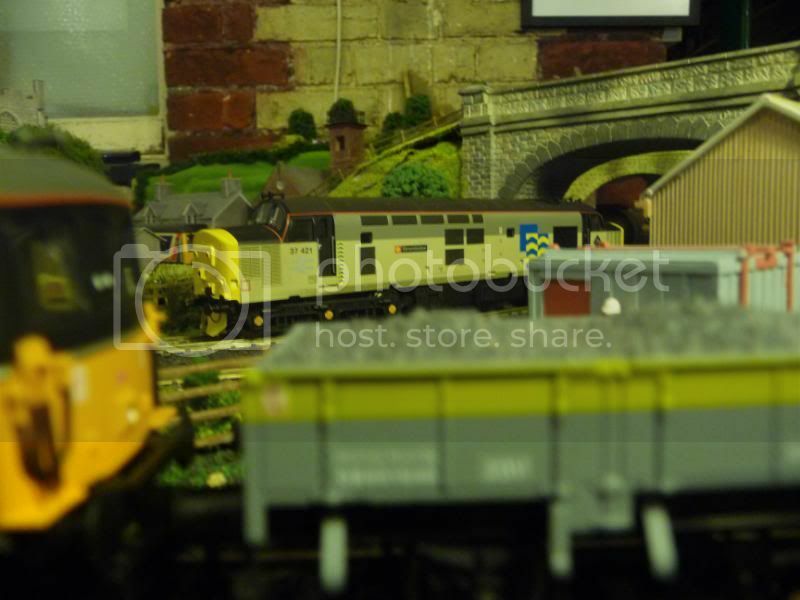 trainsandco wrote: wow Darren, that weathering really does improve them!! cheers Ben i think they look a million times better after being weathered. moving onto rolling stock i have been trying to work out a sort of list as for which loco's i'm interested in and it seems to be getting longer by the day i currently have my eye on a Vi Trains Class 47 in Intercity Swallow livery which is only £52 on hattons at the mo anyone got one of these if so are they any good? 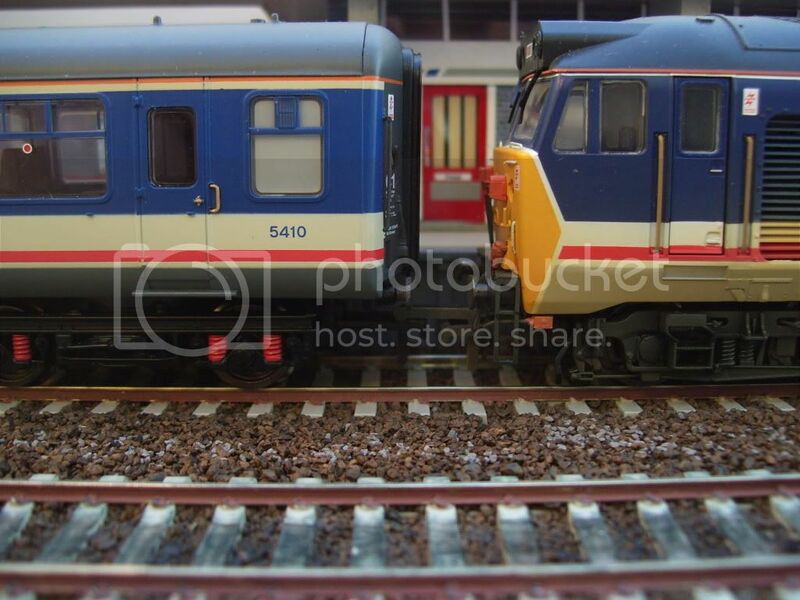 as i have a couple of hornby mk3's in intercity which are used on my HST but i thought they would look good behind it, i'm also tempted to get the new hornby intercity DVT when they are released thou i'm pretty sure they where never used with a class 47 but i think it would look rather good. As for the DVT, Wrexham and Shropshire use one with a 67 so I don't see any reason why you can't have one with a 47 at t'other end? been having a play around with my old hornby railroad range class 08 "thomas 1" i got it as a test loco when i first got the train set that set off the construction of Lordsbridge but recently it has just sat in a box under the layout so i decided to try and improve it and have it fit in with the new era of late 1980's to mid 1990's i though it could be used at the civil engineers yard so here's a couple of pics of it after its first coat of paint. was tempted to give it the dutch livery but not sure if any 08's where painted in that livery, i still need to redo the roof, get some transfers and then add a decorder but like i said it's still as work in progress. 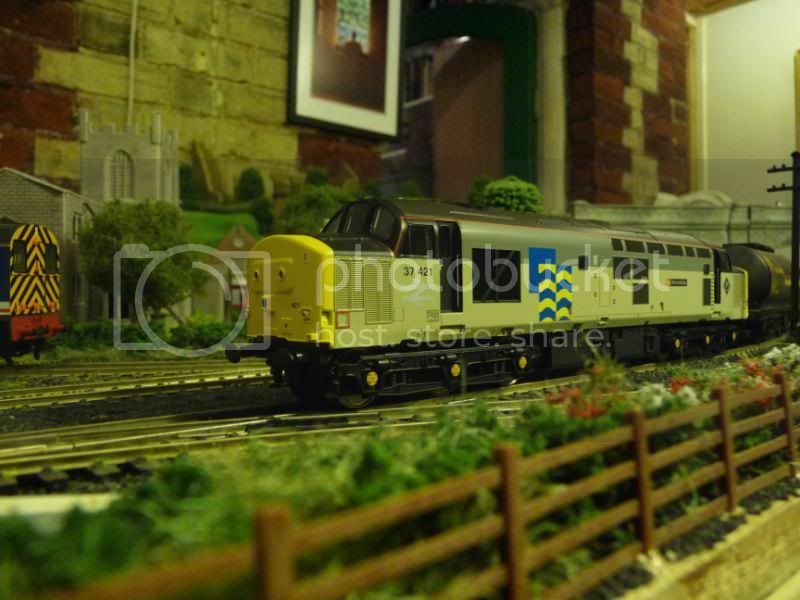 yeah i agree Lewis the hornby one is no where near as good as the bachmann one as you can see in the last pic i have a bachmann one in NSE and its a great little model and thanx for the tip regarding the dutch livery i might have a go this evening. 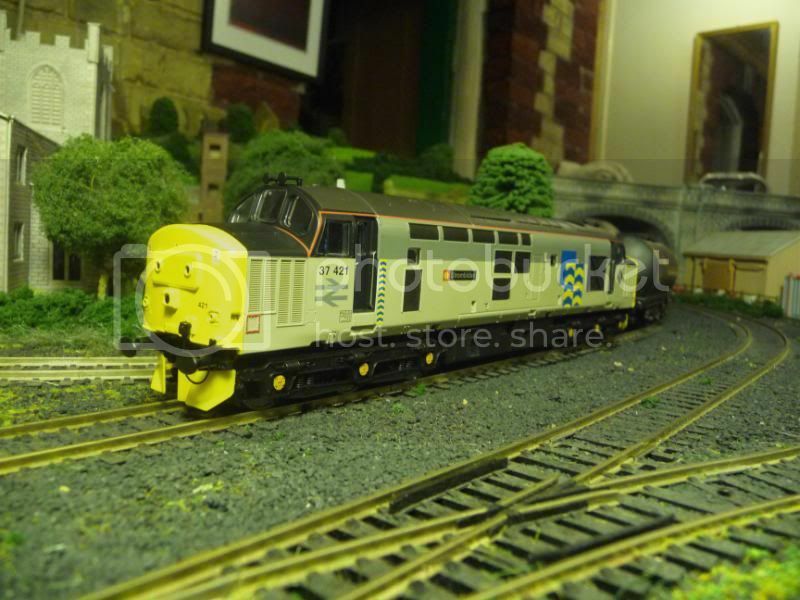 Class 37 in Railfreight Petroleum sub-sector livery and a bargin as well at £39. 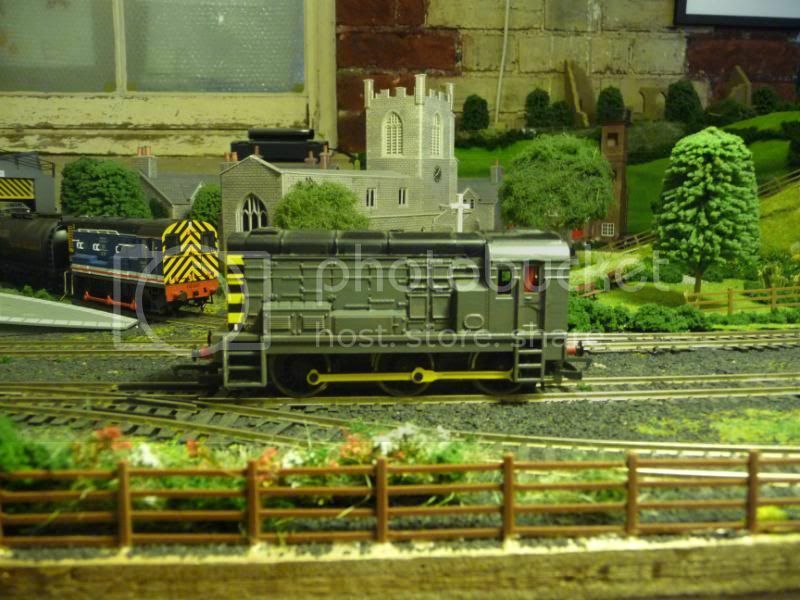 first impressions are good thou there is a lot of extra detail that need to be added something i'll probably do tomorrow when i have some time overal thou i'm pleased with it it looks stunning and it's perfect to pull my newly formed oil train. 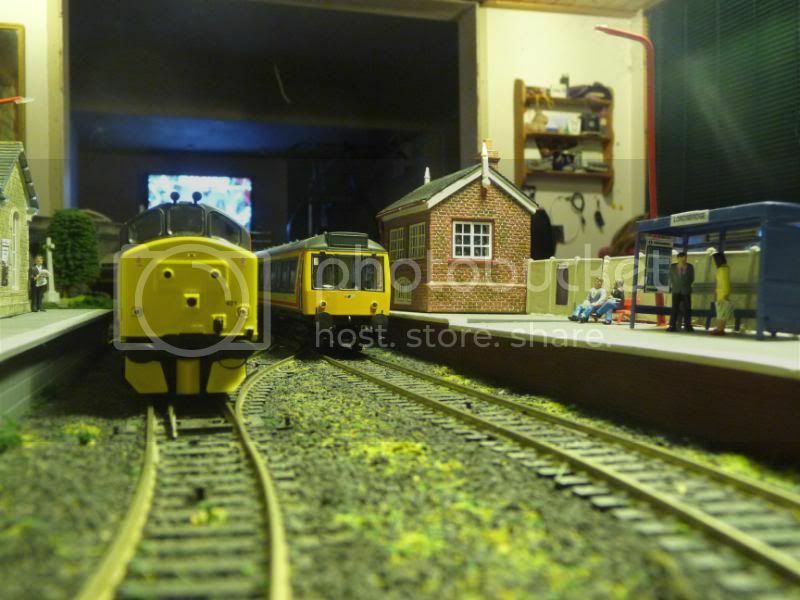 i think the scenecraft are probably the best 00 gauge figures i've found definatley much better then the rubbish hornby ones. Thanks for the info, Darren, I may have to invest in some! As far as the Railroad wagons are concerned... 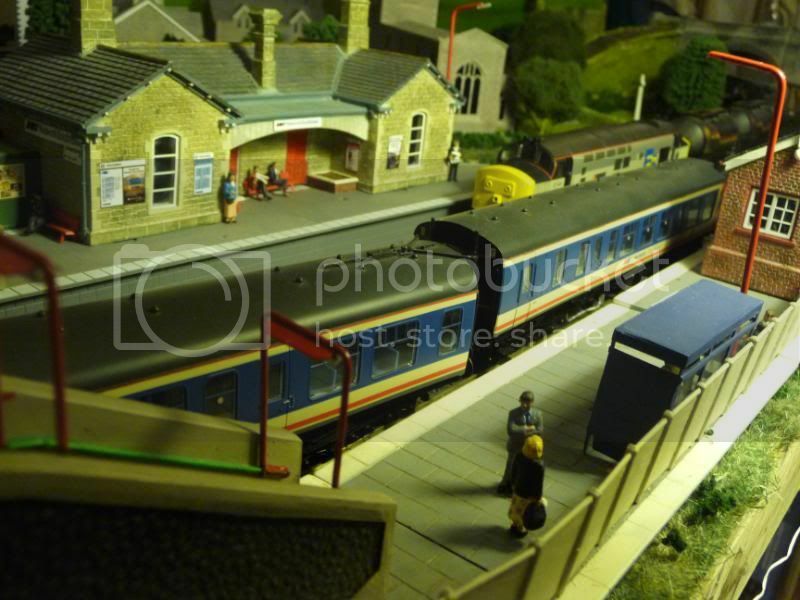 I love the Railroad NE vans, since they provide me with a proper LNER freight rake for very cheap indeed (it seems we are of one mind concerning the value of these things! ), but one thing I have found that improves them immeasurably is replacing the horrible plastic wheels they come with with metal Hornby replacements. 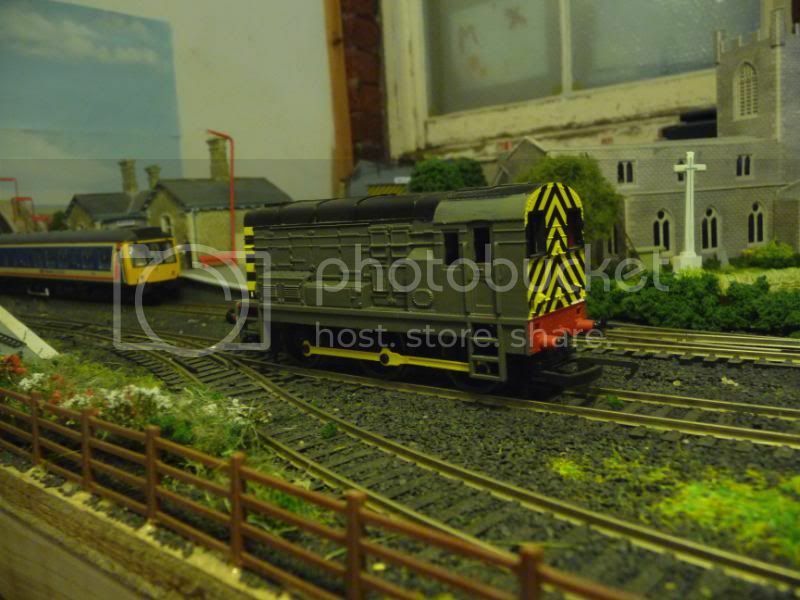 As a result, my 13-van rake is now one of the free-est -running groupings I have, and it's less likely to dirty up my tracks! A ten-axle pack of wheels costs about the same as one Railroad wagon, and I would urge you to make the replacement. You won't believe how much of a difference to the running it makes. 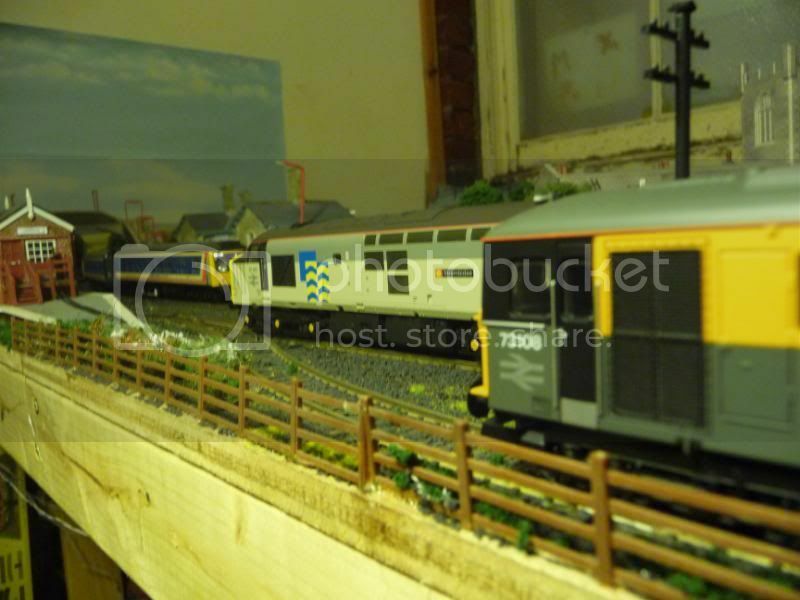 yeah i will need to pluck up the courage to have a go at weathering it at some point. here's a few pictures from todays running session. 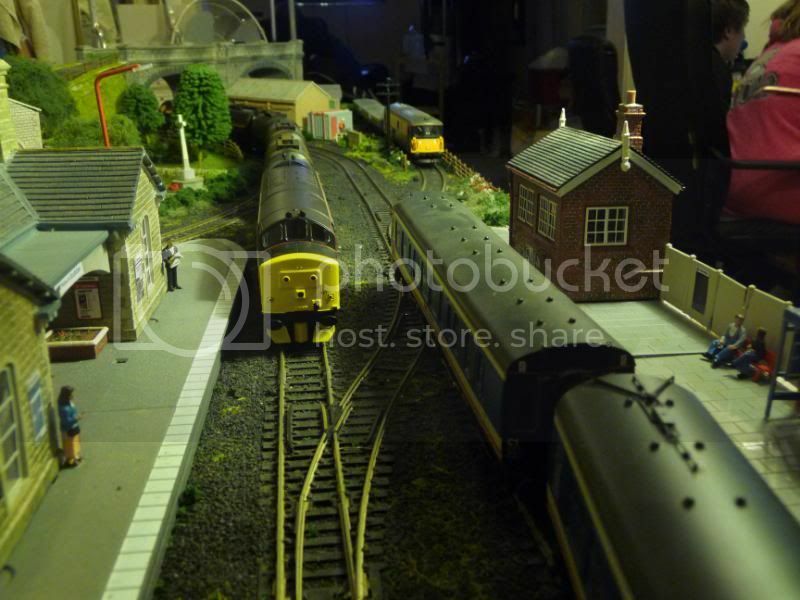 Class 37 on a oil train passes the class 73 in the civil engineers siding while it collects it's grampus wagons to be transfered to Hoo junction. 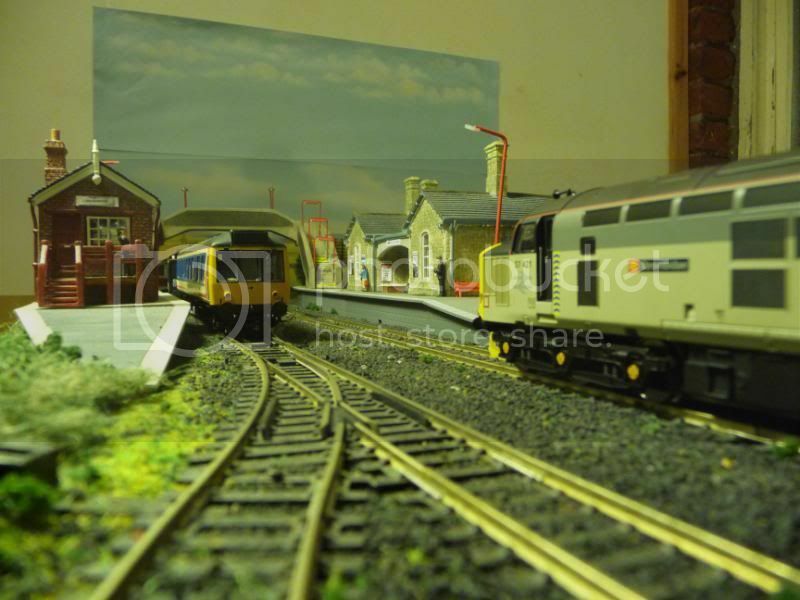 Also i'm not totally happy with the TMD at the moment so i'm going to remove the security fencing and theoffice and just leave the shed and fueling point then see what i can do, i think i might put some oil storage tank in there, as well as having a freshen up of Lordsbridge high street i'm thinking of replacing on of the cottages with a shop. who are those extra big passengers on the far right of the 2nd photograph? trainsandco wrote: who are those extra big passengers on the far right of the 2nd photograph? looks like it should be possible. 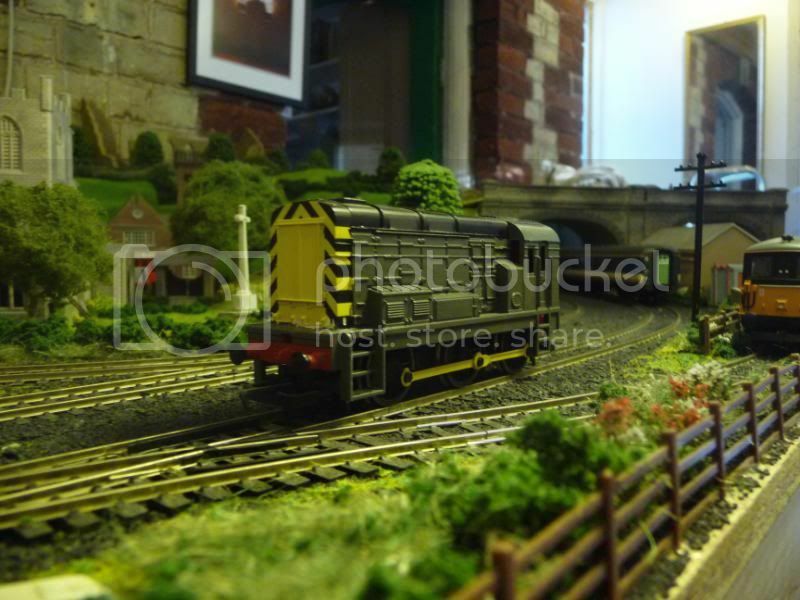 Some really nice locos you have there! Speshully liking the 37 and the 08s! Thanx for the advice Gavin i seemed to missed your post before sorry anyway i'm going to order the replacement wheels in the next week so i'll let you know how it goes. 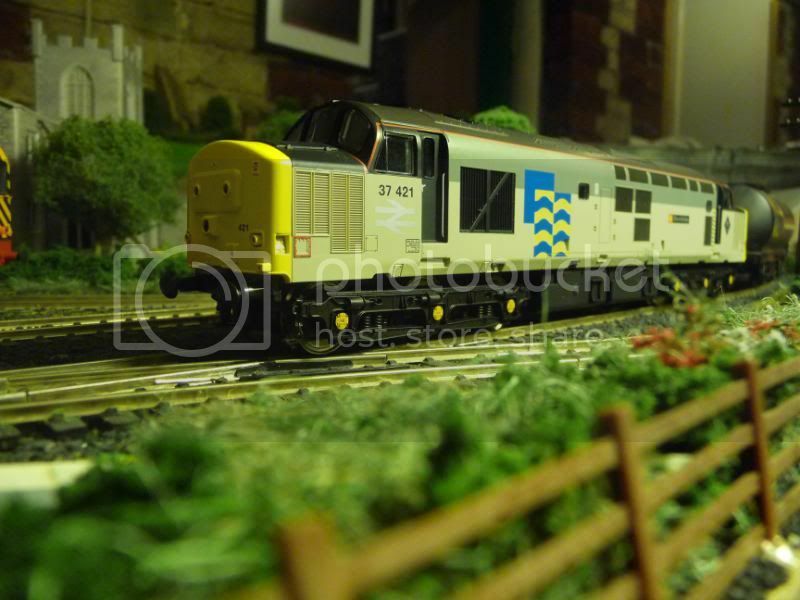 As for the class 37 i think i might have become a bit of a fan so much so i might add another one to my loco fleet at some point this year maybe the vitrain regional railway one as its cheap on hattons at the mo.